Place the unbaked pie shell in a 9-inch pie pan. Mix together butter and sugar. Add eggs and vanilla and mix well. Add salt and sugar, and mix well. Fold in pecans and chips. Pour mixture into pie crust and bake at 325º F for 1 hour. Let cool for 1-2 hours before slicing. 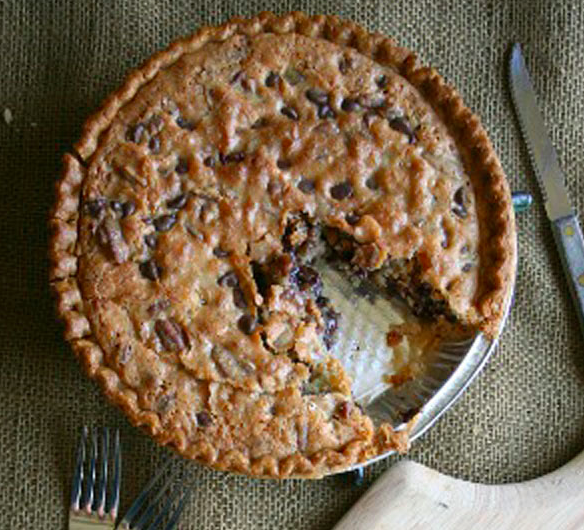 Derby Pie was created in Prospect, Kentucky in 1950 as a signature dessert of the Melrose Inn. Derby Pie became a registered trademark of the Kern's Kitchen in 1968, and more than 25 lawsuits have been filed by the family to protect it. The makers of similar pies have had to come up with different names, including Not Derby Pie. I baked this pie for my company's annual BBQ at the Belmont Park horse races. I thought the name was apt since it's NOT the Kentucky Derby. It must have been good because I didn't even get a slice. You had to be fast as a racehorse to get a slice!